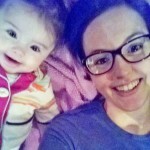 Kayla is a mommy blogger from a small town in Virginia. She is raising a baby girl, three dogs and a red-headed husband. Kayla is obsessed with three things: her daughter, celebrity gossip and animals.